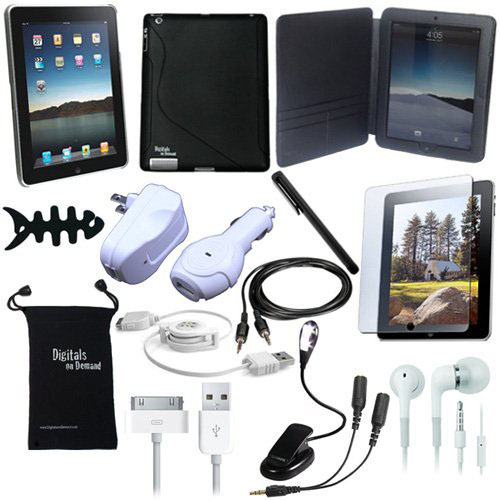 DigitalOnDemand 15-item iPad Bundle is the perfect gift for this holiday season. The iPad accessory bundle includes a Black iPad Skin Case, Crystal Clear Case with detachable Kick Stand, Premium Leather Case with Kick Stand, Screen Protector, Portable Mini LED Adjustable Reading Book Light, Earphones, Earphone Splitter, AUX Cable, Wall Charger Adapter, Car Charger Adapter, USB Sync Cable, Retractable USB Data Cable, Fishbone, Drawstring Travel Pouch and Black Stylus Pen. It’s currently 50% off at Amazon.com.